“Alex, they only have the convertible Fiat available, are you okay with that?” LOL Why wouldn’t I be okay with that? Of course, I’m okay with that! Top down, windows down, wind gusting past my face, I can’t help but feel overwhelmed with excitement and joy in this present moment as we leave Athens to head to Evia. As the Greek music plays loudly through the speakers and we drive up through the astonishing mountains with panoramic views of endless blue, I am in awe of the scenery that we are driving through, such picturesque beauty that I’ve never experienced before. Driving around an unknown land must be one of my top favorite things to do. It may sound boring to some but for me? I love it. As we drive past mountains, beaches, farms, archaeological monuments, and vineyards I ask Milti, “Do you know where we are going?” “Kind of,” he responds. “But what if we get lost?” I ask. “Well then, what a place to get lost!” I hate to admit this, but Milti is right most of the time. What a spectacular place to get lost and to think this brought me no anxiety, just more excitement that could stimulate anyone’s adrenaline. About a 4-hour drive from Athens, Evia is Greece’s second-largest island. Although being one of the largest islands, Evia is almost invisible on the travel radar, making this the perfect destination to dig deep into the Greek culture and avoid tourists which is just the experience I was seeking. I wonder how such a magical place has managed to stay relatively unknown, but I prefer it this way. It’s such a hidden gem! Being part of the crystal clear blue water of the Aegean sea, but also connected with the golden mainland by road, Evia is a blessed place. 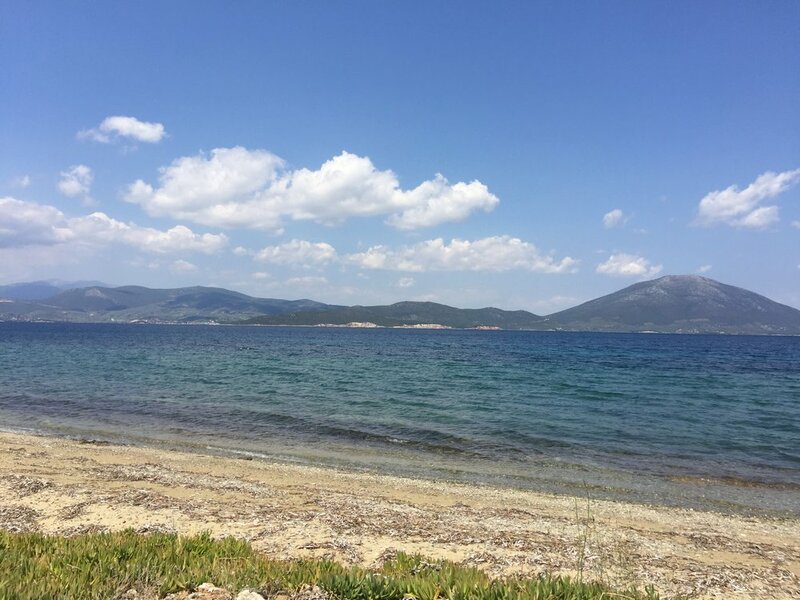 Evia is an ancient land with over 110 beaches! I mean, I could stay there for over 4 months and go to a different beach every time. Yes, please! Now we are talking! This island has many small, almost secret and humble villages with many historical churches. Here you will find charming pine forests right out of a Disney movie, olive trees, oregano fields, and hot healing Thermal Springs. The soil is rich and the water is nothing less than magnificent. An island of an absolute delight. This is a place that will take your breath away! As we make our way into Orei, I can’t wait to arrive at Milti’s house! If you weren’t aware, Milti has a house in the village of Orei (which means beautiful and if you ever go, you will understand why). Orei is a seaside town on the northern end of the island. This settlement has a tranquil atmosphere. Milti’s aunt awaited us upon arrival. She spoke no English, and I spoke no Greek, but by the end of the trip we were able to communicate (sort of). And even though we spoke different languages, one thing remained very clear: Hospitality. I now totally get Milti’s understanding of hospitality! Greeks are incredibly warm, kind, friendly, and inviting. They all want to feed you too, which reminded me of my Grandma Drago, RIP. Here you live a very simple life. There is no internet. There are no washer and dryer. You wash your clothes in the sink and hang them to dry. Yup, just like the old days. There are no TVs. There are no microwaves. You eat what is in your backyard, and pick the fruit off your trees. Milti had a ton of olive, fig, nectarine, and lemon trees, etc. There were basil plants, tomatoes, tea leaf plants and more! I fell in love with the Feta and olive oil in Greece. You bet I smuggled bottles of olive oil from his yard back to the States with me. I want to drink it! Is this what olive oil and feta are supposed to taste like? Pure BLISS. All the food here is natural, non-processed, and organic. At this point of my journey, I am happy to say bye to my artificial life environment, leave my comfort zone, and get ready to emerge myself with the fully enhanced properties of nature and embrace it to the fullest. Since there isn’t much to do here besides relaxing, we decided to walk down to the beach. I carried along my journal which I wrote in every day. On our walk down, we met a cute little friend who I quickly fell in love with. Once we arrive at the beach, we are the only ones there. We ask how much it is to rent the lounge chairs for the day and they say $5. LOL! In Miami, you would be paying $300 for a beach bed with a view like that if not more! Oh, the joys! The beaches are beautiful, there are mountain views in every direction which is simply magical. The water actually sparkles under the sun. We swim in the clear water and have fun picking out all the white marble rocks. Greece is made out of marble. There is white marble everywhere. We head back to our chairs, eat a simple lunch and fall asleep. Here, time does not exist. There is no such thing. There are no worries and no stress. I feel my skin becoming golden (Yes, I was wearing a ton of SPF) and notice my hair strands are blonder. We awaken to the high tide coming in and touching our feet. Oh, the struggles! Here it is normal to walk to the neighbor’s homes. Since it is a small village, everyone knows everyone, and a lot of the people are relatives. The neighbors are so friendly, and again want to feed you the fresh food they picked from their yards earlier in the day. They offer us pasta, feta, olives, biscuits, wine, coffee, figs, etc. Something significant about the cuisine in Europe is that I feel great. Meaning, I don’t feel bloated even when I’m full. I don’t feel overly stuffed or sick. I don’t have to avoid gluten or dairy here. The food is fresh and I feel so energized! Is this how you are supposed to feel? I think so… I’ll touch on that topic in another post. Every night after the sun went down, we walked to the restaurants and cafes near the waterfront. Every village has this. There are old fashioned shops, music, laughter, and joy. At first, I thought the village was having a special celebration but found out this happens every night. Something I had to get used to is that the Greeks dine late. But again, time doesn’t really exist or matter here, so OPA! The food is just so fresh and delicious. All the meat is tasty and free-range. There are dogs everywhere which add even more joy to my late nights. A beautiful land with the best food and dogs everywhere, are we sure I’m not in Heaven? I love that everyone knows one another, it adds so much character. This is the ideal destination for exploration so naturally, we spent our days exploring. We made sure to get lost every day to see where the roads would lead us and each day they led us to a different, unique beach. I can see why the locals say that Evia is known for its beautiful pristine beaches, as they all border the Aegean Sea. It was exciting to see the different villages, some seaside villages and some mountain villages. The captivating colors and blossoming flowers definitely captured my attention. The birds are also remarkable! Milti and his Aunt took us to their village church were his Father, Grandfather, and himself were all baptized. On our last two days in Evia, we spent them in the Spa Town of Aedipsos. Aedipsos meaning “Healing.” Aedipsos contains thermal healing springs which are known since the ancient time from the scripts of Aristotle and Plutarch. Adipose has more than 80 spring sources with high temperatures! It is to be rumored that these waters hold magical healing properties, cure diseases, and revitalize your body and soul. Legend also has it that Hercules rested here after his labors. To read about My Healing Experience In Aedipsos click here. To sum up this experience, I have never felt more rested, relaxed, and rejuvenated ever. I was able to meditate daily, become emerged in nature, eat healthily, explore new things, journal daily, and let go of the stresses of our “busy” lives. The number one lesson I learned is that Life Is Good. Traveling is life changing. It changed my life and it will change yours too. It’s beautiful and eye opening. The more you explore new places, the more you get comfortable with the unknown. Traveling is a great reminder to live light. I’ve said this in previous posts, but we don’t need much of the stuff that we collect. Evia was a healing journey for me, and very different than my experiences in Athens and Santorini. Santorini and Mykonos have consistently won awards for “best islands” in Europe. But Greece is much, much more. I urge you to travel the unknown including this majestic place. I look forward to exploring more of Greece in the future. To get over your fear of traveling click here. To read my travel tips and experience in Santorini click here.